If you are looking for a recreational lakefront experience you may have discovered your dream location here at Peaceful Cove. 8 immaculate log cabins right on the lake! See our section on cabins for pictures and prices. We can take couples on a romantic getaway, weddings and accomodations, family camping, family reunions, as long as you are seeking the tranquillity and beauty on the lake. 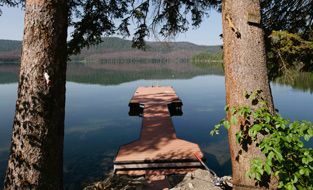 We have 8- 15 amp RV sites and 5- 30 amp sites all right on the lake. Each with water hook-ups to provide good pressure to shower in your unit. (showers not provided) and a sani dump when you leave. We have lots of firewood to burn so the fire casts light on the great story tellers around the campfire. This is the life! Call us to answer more of your questions...we welcome the personal contact. 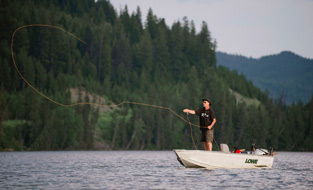 Avid fishermen and aspiring beginners love this lake for the fight of the different species of Rainbow trout. A spawning creek flowing through the resort attracts many fish seeking food, oxygen and a place to lay eggs. We have our own boat launch, fish cleaning shack and scales to weigh your monster catch. Wonderful hiking along the lake where we often see deer, bear, eagles, loons, and lots of ducks, who are often startled by grouse. More strenuous hikes up the mountains reward you with a spectacular view of the lake and surrounding lakes and mountains. The fall season offer breathtaking colors and a luring fall fragrance that is addicting. 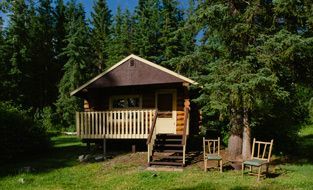 Hunters are ecstatic with the accomodations, as well as the deer, moose and grouse that populate the area. Find out more about Lac Des Roches on Hwy 24. At Peaceful cove we have 8 log cabins 5 with full showers, toilets, sinks, kitchens, dishes, pots, pans, free standing wood stoves and a deck for morning coffee or evening sunset sips of wine. We have been known to round up an extra mattress to lay on the floor for a kids sleep-over type experience. Each cabin has a coffee pot. Bedding and towels are provided for cabins 1-5, but bring your own bedding and towels for cabins 6,7&8 (the rustic cabins). Get ready because there will be an array of amazing photos to add to your albums. Reserve your cabin today!